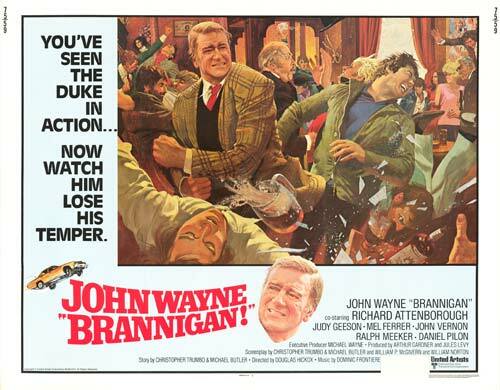 BRANNIGAN has one distinctive bit of ironic trivia attached: it was written by Christopher Trumbo, son of blacklisted Dalton Trumbo, whose return to official screen credits began with a one-two liberal punch of Spartacus and Exodus, both battling for freedom against Duke’s The Alamo back in 1960. 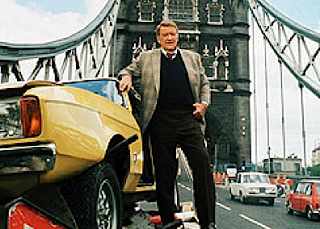 Fifteen years on, 1975 sees John Wayne as a Chicago cop (with an attitude, naturally) going to London to extradite a gangster. Hit men for the mob have other ideas. Explosions, car chases, shootouts and a barroom (make that pub) brawl disturb the tranquility of the English hosts. Few bought it, with a foggy $4,400,000 take not even clearing the top 92 for the year. Piloted by Douglas Hickox, lasting a drab 111 minutes, giving yeoman but thankless duty to Richard Attenborough, Judy Geeson, Mel Ferrer, John Vernon, James Booth, Ralph Meeker (quite a comedown from Paths Of Glory) and Lesley Anne-Down.